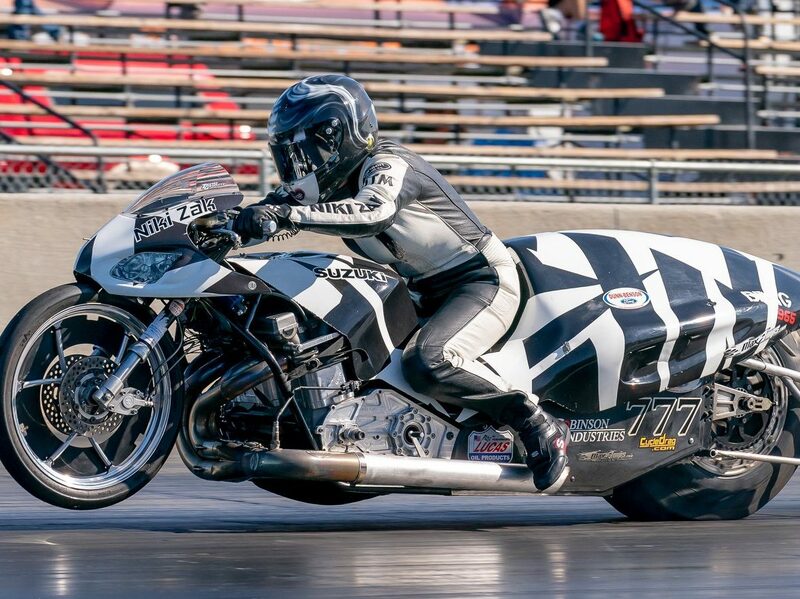 The World’s Quickest and Fastest Woman on Two Wheels returns to the US to compete at South Georgia Motorsports Park in Adel Georgia April 5-7th in the Man Cup sanctioned event. Niki, from Sydney Australia will be returning to the track where she set the World Record for a woman with a 6.409 at 207.50 MPH in the quarter mile in November of 2017. Niki has been working tirelessly on her Race Program and motorcycle she affectionately calls “Pony” and with her new tuner Jim Clapsaddle getting the engine freshened and tuned up to hopefully break some records and win at the Man Cup event. Niki is eager to get back to the track and ride “Pony” again. “I’m excited to get back on Pony and see what numbers I can run. I have not missed a day of strength training since leaving the USA in December after PRI show in Indianapolis. I have a lot of boxes to check this year and one is to compete in some other sports and I will keep all my fans updated probably after the event but Pony is my priority and we will go fast I just know it. It’s good to be back in the USA and I look forward to seeing my race family, friends and all the fans. I want to say a special Thank You to Kemp Lamm, Wayne Castleberry and Dunn Benson Motorsports for all their help and support and also to all my sponsors, Dunn Benson Ford, Lucas Oil, MaxAmps.com and I don’t want to forget Kim’s BBQ House in Dunn NC, with yummy homestyle cooking and Pony and me got our picture on their wall with so many great people from the local area. Thanks to everyone that support me and my race program, I am so very grateful”, stated Niki Zak. There are more videos on the Cycledrag Youtube channel (please subscribe here) and the Cycledrag.com Facebook page (Please like here) and more will be coming soon. Check back daily. Niki Zak’s merchandise will also be on sale at South Georgia Motorsports Park at her Race Trailer on the midway and now accept credit cards trackside. Niki Zak’s official website at www.NikiZak.com also has all the latest Niki Zak Racing Apparel, Merchandise, Posters, Decals plus more at her online store at http://nikizak.com/store.html. To keep up with the Quickest and Fastest Woman on two wheels visit www.NikiZak.com for the latest news, schedule, pictures and more. For companies or individuals interested in partnering with Niki Zak Racing, email NikiZakRacing@gmail.com. Be sure to follow Niki Zak Racing on Facebook at Niki Zak Racing and you can click on SHOP NOW for purchases.